The axolotl, a species of permanently aquatic salamander, has an ability to regenerate lost body parts that is unrivaled among vertebrates. Researchers are using what they learn from axolotls to probe the potential for regrowth after injuries in other animals. In a loudly bubbling laboratory at Brigham and Women’s Hospital in Boston, about 2,800 of the salamanders called axolotls drift in tanks and cups, filling floor-to-ceiling shelves. Up close, axolotls are just on the cute side of alien. They have fleshy pink bodies and guileless, wall-eyed faces. Unlike most salamanders, which metamorphose into land-dwellers as they grow up, axolotls usually keep their youthful aquatic form for their whole lives. They wear their gills on the outside, a set of three feathery horns on each side of the head. Their four-fingered hands with black nails are delicate and vaguely human — but perhaps it’s best not to dwell on that, given the work that goes on here. One of the animals in view is missing a limb that was amputated 11 days earlier. The stump has a reddish bull’s-eye visible at its center. It’s the bud of a new arm. “The genome was a huge problem that had been lingering over the heads of everyone working in axolotl,” said Jessica Whited, the assistant professor and researcher who supervises this laboratory at Harvard Medical School and Brigham and Women’s Hospital. Now that she and other researchers have the whole axolotl genome, they’re hoping to unlock secrets of regeneration and perhaps even to learn how humans could harness this power for ourselves. But they still have more questions than answers, and some of those questions have persisted since the first documented observation of these animals’ strange talent more than 250 years ago. The simplicity of the Italian priest’s diagrams belied the miraculousness of what he had seen. Lazzaro Spallanzani’s first sketch resembled three sides of a square, like a little table in profile; it was the stump of a salamander’s severed tail. The next showed a triangle sitting atop that table; the tail was somehow regrowing. Spallanzani had been experimenting on salamanders, tadpoles, snails and earthworms and found that they could regenerate lost body parts. He shared that discovery and his drawings in a letter to the naturalist Charles Bonnet in 1766. Two years later, Spallanzani published his observations more widely in a brief collection of essays on reproduction and regeneration. The title of that 1768 collection, the Prodromo (meaning “an early indication”), hinted that a longer work on the subject would follow from him — but it never did. Other scientists did take up those investigations, however, and researchers’ salamander of choice became the axolotl. Its scientific name is Ambystoma mexicanum; its common name rhymes with “packs a bottle.” Axolotls lent themselves well to study in part because they breed and survive so well in captivity. Warren Vieira, a postdoc in Catherine McCusker’s regeneration lab at the University of Massachusetts Boston, told me that axolotls sometimes wag their flat, eellike tails when a person comes into the room. Researchers who care for the animals generally agree that axolotls are inquisitive and alert to the presence of humans, who might be bringing food, although in general the axolotls are not too bright. They are extremely inbred, after all. Most of the world’s laboratory axolotls are descended from 34 animals that came to Paris from Mexico in the 1860s. (Most wild axolotls are a mottled mud color rather than pale pink, but the lab animals are not albinos — true albino axolotls are yellowish, with golden eyes rather than black.) Since those animals were removed, their native waterways around Mexico City have been polluted, invaded by introduced species that altered the ecosystem and dramatically depleted by urbanization. Axolotls are also a traditional food for locals. Ironically, for animals that can survive so many horrible injuries, axolotls haven’t been able to withstand these combined assaults and are now nearly extinct in the wild. But the laboratory population has thrived. In 1935, some of those European axolotls came back to North America and eventually became a collection at Indiana University under the direction of the biologist George Malacinski. When he retired in 2005, the University of Kentucky inherited his colony of 500 or so animals. 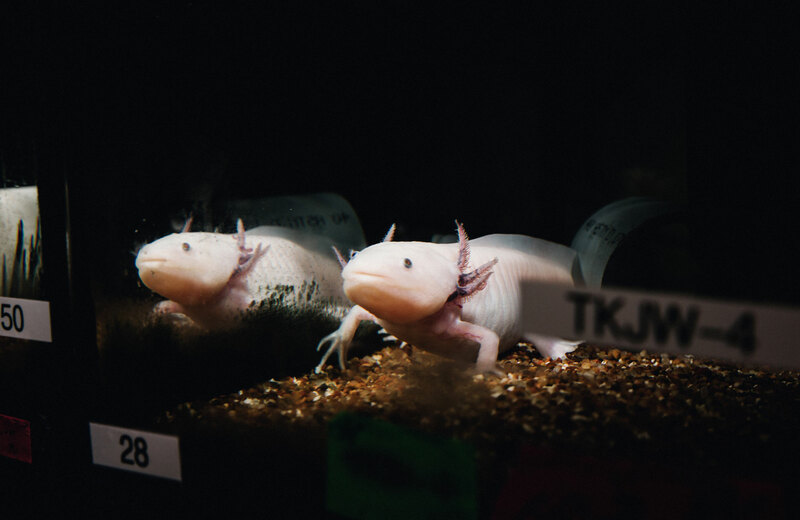 Malacinski “just loaded them all up and drove them down one night,” said Randal Voss, who now directs the university’s Ambystoma Genetic Stock Center. Although the drive lasted only about three hours, the stress made some of the salamanders metamorphose. “Maybe 10 percent or so decided they didn’t want to be aquatic anymore because of the ride from Indianapolis,” Voss said. Axolotls have thrived as laboratory animals at the same time that their natural population has plummeted to probably less than a thousand. But although these labs have learned much from the axolotl, none of them could fully sequence its genome. The main problem with the axolotl genome is that it’s enormous. It has 32 billion base pairs, making it about 10 times longer than the human genome. Despite that, axolotls and humans seem to have a similar number of genes, said Elly Tanaka, a biologist at the Research Institute of Molecular Pathology in Vienna. These genes are like islands in oceans of highly repetitive sequence. That overabundance of repetitive DNA has been the problem. To read the sequence of an organism’s genome, scientists have to break the DNA into chunks, then reassemble those pieces like a jigsaw puzzle. 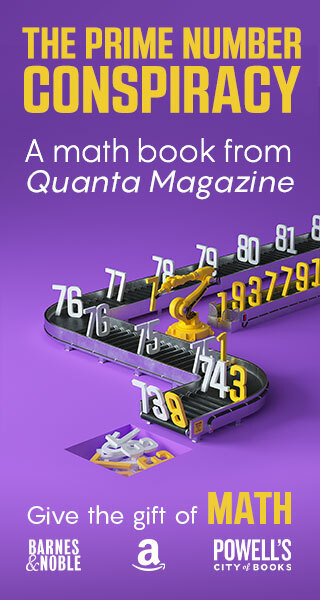 Until a few years ago, Tanaka said, “Those chunks were way too small to bridge the size of these repetitive sequences.” The technology couldn’t reach from one island of information to the next. Yet even before the axolotl genome was mapped, scientists were using other tools to begin to understand regeneration. In James Monaghan’s lab at Northeastern University in Boston, Johanna Farkas, a postdoc, handed me a pair of what looked like sunglasses. We were facing shelves lined with dozens of axolotl tanks; the lab keeps about 400 or 500 animals. (“There might be more in this room than there are in the wild now,” Farkas said.) The snub noses of the salamanders, drawn to the fronts of their tanks when people enter the room, followed us back and forth. Farkas told me to look at a large adult axolotl whose skin has a yellowish cast. After I put on the sunglasses, she pointed a blue flashlight at the animal, who shone vivid green. That animal comes from a line of axolotls that scientists genetically engineered to make a green fluorescent protein normally found in jellyfish. The glasses, which filtered out all wavelengths except green light, let me see its fluorescence. Other axolotls have been engineered to make a red fluorescent protein. 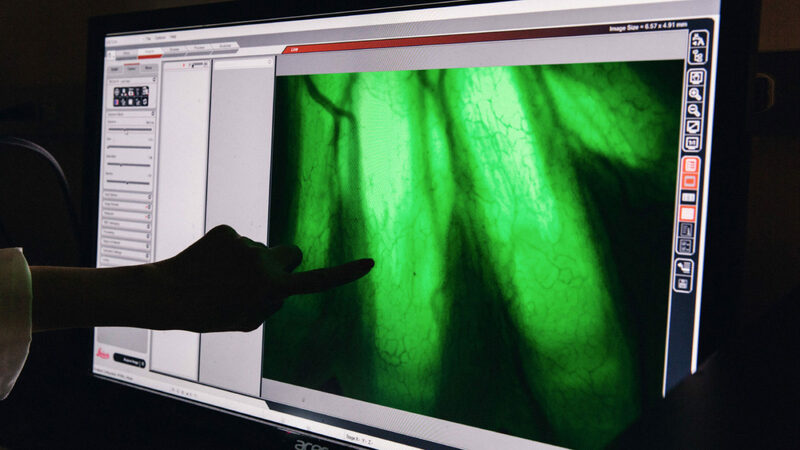 Researchers can exchange grafts of tissue between the red and green fluorescent varieties, or between glowing and nonglowing animals, to track the movement of cells during regeneration. The stages of regrowth for a salamander leg are visible in this composite image. The intact limb is at the left; the series to the right shows the gradual regeneration of the limb over a couple of months. Such experiments let them see, for example, where the cells that make up a new appendage come from. After an amputation, a salamander bleeds very little and seals off the wound within hours. Cells then migrate to the wound site and form a blob called a blastema. Most of these recruits seem to be cells from nearby that have turned back their own internal clocks to an unspecialized or “dedifferentiated” state more like that seen in embryos. But it’s unclear whether and to what extent the animal also calls on reserves of stem cells, the class of undifferentiated cells that organisms maintain to help with healing. Whatever their origin, the blastema cells redifferentiate into new bone, muscle and other tissues. A perfect new limb forms in miniature, then enlarges to the exact right size for its owner. A blastema cut off and transplanted elsewhere on the body can still become the limb it was meant to be. But no new limb will grow unless nerves reach the blastema during an early critical period: If a limb’s nerve is severed, an amputation will simply heal over. Researchers have found that immune cells called macrophages are also important for regeneration in salamanders; they help to control inflammation that would impair the process. Meanwhile, connective tissue cells called fibroblasts carry positional information that’s crucial for regrowing a limb. This positional memory is how a cell knows where it is in the body: Is it part of a left wrist? A right shoulder? The top or bottom of the arm? Positional information, Monaghan said, is “kind of a molecular zip code” laid down in an animal’s epigenome — the set of chemical tags attached to a cell’s DNA that can direct the activity of its genes. The varied epigenetic tags in different cells give the cells information about where they are. 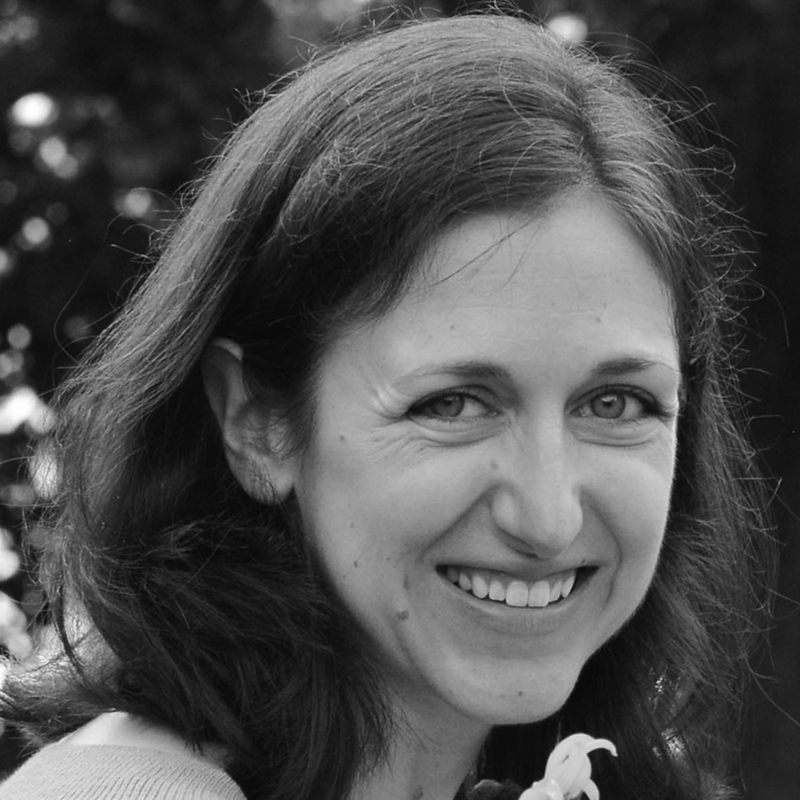 Video: Jessica Whited is a biologist who studies limb regeneration at Harvard Medical School and Brigham and Women’s Hospital. 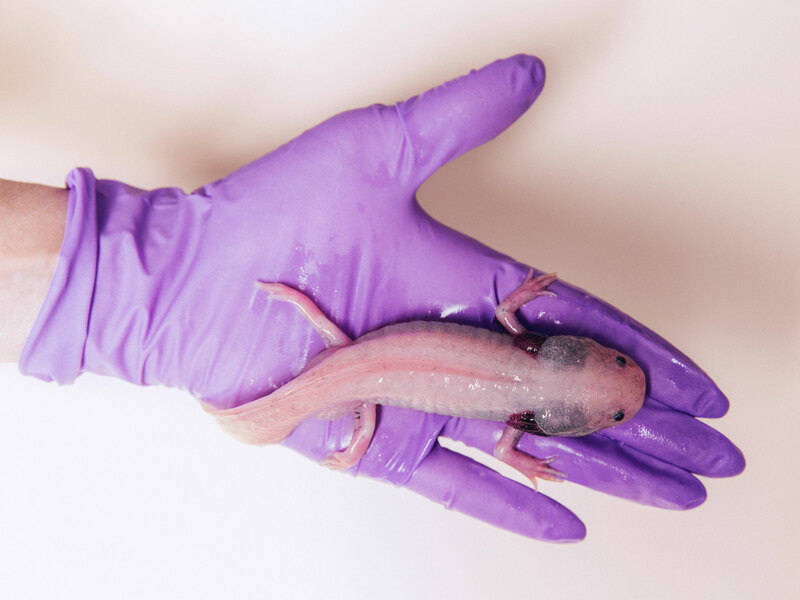 Here, she explains how genomic information for the salamander called an axolotl will help us understand the potential for regrowing limbs in humans and other animals. Retinoic acid, a molecule related to vitamin A, is involved in positional signaling, too: A big enough dose of retinoic acid can rewrite a cell’s zip code. One axolotl staring at me in Monaghan’s lab had one normal arm and one extra-long one, a condition he calls “spaghetti arm.” Researchers created it by amputating the animal’s hand and then adding enough retinoic acid for the wrist stump to think it was a shoulder stump. A whole new arm regenerated from the wrist as a result. Arms, legs and tails aren’t the only body parts that laboratory axolotls can regrow. They also recover from crushing injuries to their spinal cords. “They can regenerate a millimeter-by-2-millimeter square of their forebrain,” Monaghan said, “which is insane.” Scientists haven’t looked too closely yet at the regenerative powers of axolotl organs. But Monaghan’s group has so far studied axolotl hearts, lungs and ovaries, and found that all three can grow back after injury. But these may not be mysteries for much longer. “It wasn’t me, actually!” Elly Tanaka said, laughing. “It was my other collaborators, the other guys who were able to put together an algorithm to assemble such a big genome.” A group that included Tanaka, computational scientists and others reported this past February in Nature that they had sequenced the full genome of the laboratory axolotl. Improved technology can now read a genome in big enough chunks for some of them to bridge the long, disorienting stretches between an axolotl’s genes. Using brute computing power and new algorithms to complete the puzzle, the researchers were at last able to read the whole genome. In principle, the availability of the full axolotl genome sequence puts researchers in a much better position to answer major questions about how regeneration works in the animals. For example, does an axolotl regrow its limbs using unique genes? Or does it use genes that other animals (including humans) share, but does it control them differently? Those answers are still to come. Tanaka said the goal of the Nature publication was merely to put the sequence out there for scientists. “The real mining of the genome to understand regeneration, that’s ongoing now and will take some years,” Tanaka said. But she and her coauthors did make some intriguing preliminary observations. “In the regenerating limb tissue, we seem to see a relatively high number of genes that don’t have a clear human counterpart,” she said. Investigating these genes — which aren’t present in other mammals, fish or birds, either — will likely be “a fruitful avenue” for understanding regeneration, Tanaka and her coauthors wrote. It’s important to note, however, that although the axolotl genome has been fully sequenced, that sequence information is still in many, many pieces, like the pages of a book that’s lost its spine. Voss’s group at the University of Kentucky put together its own axolotl genome sequence in 2017, but that sequence was in about 100 times more pieces than Tanaka’s. According to Voss, his group is now working on getting the pages of the axolotl genome in the right order. Mapping the genes onto chromosomes will make the assembled genome easier for other scientists to work with, he said. Until the genome of the axolotl was recently sequenced, researchers had to wait more than seven months to see whether young ones would become male or female. Before the full genome of the axolotl was published, researchers who wanted insights into the animal’s molecular biology were mostly stuck looking at the protein and RNA products of axolotl genes. They couldn’t read the source material. But a gene’s products don’t tell you how it’s turned on or off, or what epigenetic marks the cell has made on the DNA to affect its expression. Monaghan wants to know, for instance, what changes in gene packaging and regulation turn a hand cell into a shoulder cell — that is, turn a regular axolotl into one with spaghetti arms. “We couldn’t even tackle this question before,” he said. Without the sequence, it was also hard to study axolotls using genetic engineering. If you got rid of a certain gene, for instance, and saw no change in how the salamander regenerated, you might conclude that gene wasn’t important — but in fact it might be so important that the salamander has backup genes you haven’t found yet that do the same task. Monaghan said his group is already using the new genome sequence as a reference to make genetically engineered salamanders with CRISPR, the revolutionary genome-editing technology that became available only a few years ago. 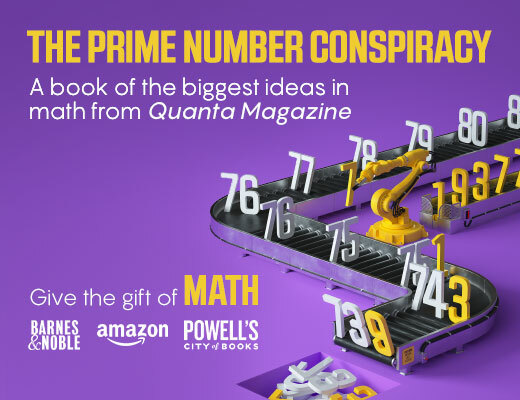 Without the sequence, “It was just too much work to figure out,” he said. That genetic information will get better and better over time, said McCusker at UMass Boston. There’s always more to be learned about the sequence, she said, and more holes to fill in. The genome will go from a big, grainy picture to one with higher and higher resolution. “No genome is ever complete. Even the human genome,” she said. As they move into a new era of research, the heads of salamander labs around the world will gather in Vienna this summer at a first-of-its-kind meeting. They’ll discuss how to use the genome sequences and other resources and will strategize about bringing new people into the field of axolotl research. Already, he and other researchers are finding potential applications for their research in human medicine. Monaghan is studying axolotl retinas to try to improve the outcomes of prospective stem cell therapies in aging human eyes. He also thinks finding out how axolotls rapidly regrow their lungs could help us learn to heal human lungs, which naturally have some regenerative power. Whited is studying whether the same proteins that are important in salamander limb regeneration could also be indicators of a good healing response after amputation in mice. Ultimately, this might help doctors predict which human patients will recover from traumatic limb injuries. McCusker has studied how the tissue environment of a salamander’s regenerating limb controls the behavior of cells. Someday, we might be able to regulate the environment around a cancer cell and force it to behave normally. “Regenerating tissue actually shares a whole lot of similarities with cancer cells,” she said. In 1952, a scientist named Charles Breedis injected coal tar and other known carcinogens into the arms of more than 500 newts — amphibians related to salamanders that can also regenerate. Only two animals grew tumors. Much more often, the newts responded by sprouting an extra arm. If scientists can crack how a carcinogen triggers that kind of regenerative growth, it would be “some kind of holy grail” for this area of research, Whited said. The rosy little babies, their faces framed by fluffy gills, are adorable. They’re also cannibalistic. Vieira points out some that are missing arms or legs from each other’s nibbling. It’s possible that for salamanders who start their lives in pools of hungry siblings, regeneration isn’t just a cool trick, but necessary. That could be why they evolved the ability — or why they kept the ability while other animals lost it. Whited said the jury is still out on how exactly regeneration has evolved. Based on evidence from fossils and genes, most people in the field believe it’s an old trait that today’s animals have largely lost. But Whited is open to other possible origins for regenerative abilities. One theory that interests her is that “axial” regeneration, involving the regeneration of the tail along the body’s main axis, might be an ancient ancestral capability, while “appendicular” regeneration of the limbs may have evolved separately and more recently. If regeneration is an ancient trait, mammals like humans could have some of the tools still kicking around in their genetic drawers. It may be that other healing processes we’ve evolved, such as scarring, get in the way and block regeneration from happening. Whited noted that human amputees sometimes develop a painful condition called a neuroma — an uncontrolled growth of nerve fibers in the stump of a lost limb or digit. Perhaps this regrowth is a remnant of regeneration that fails to reach completion. Based on her research, Whited thinks humans have more regenerative tools than we get credit for. If we could create the right environment in our bodies, we might be able to harness those tools. Someday, maybe, we could regrow limbs. Other researchers agree that it might be possible. Tanaka isn’t ruling it out. “It’s a little bit hard to know how complex it’s truly going to be,” she said. But with what we’ve already learned about how limbs grow, and what the axolotls can still teach us, she can imagine a future in which we engineer the same capability for ourselves. “I think it’s something worth striving for,” she said.